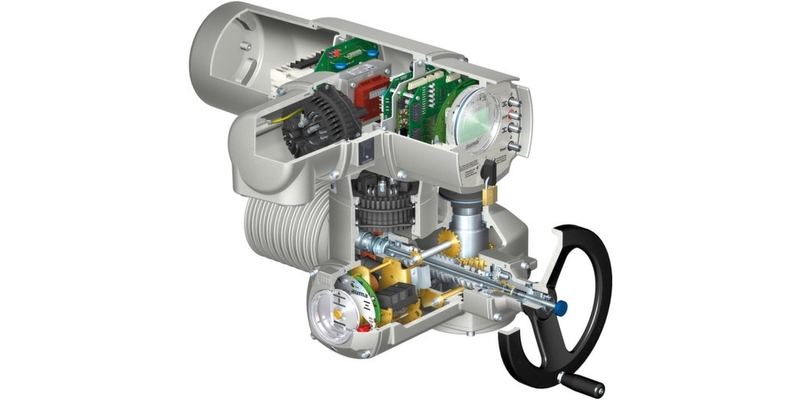 Cutaway view of electric valve actuator. Image courtesy Auma Actuators, Inc.
Electric actuators are used to enable remote control of industrial valves, allowing complex processes to be managed and controlled by remotely located control systems. Other means, including hydraulic and pneumatic, are used as motive forces for valve actuators, but electric actuators bring a particular set of features that make them an advantageous choice for many applications. Valve actuators are available in a wide range of variants to suit every application scenario. Auma, a globally recognized manufacturer of electric actuators, manufactures heavy duty actuators for demanding applications throughout every industry. Specializing in electric actuators, the company keeps their design and engineering efforts focused on a single product, its performance, reliability, and ruggedness. Enclosures rated for a variety of installations, including underwater. Learn more about the electric actuators from Auma. Share your valve and damper automation challenges with industrial application experts, leveraging your own knowledge and experience with their product application expertise to develop effective solutions.